Gov. Roy Cooper picked the youngest member of the N.C. Supreme Court to its top position. Cooper named fellow Democrat Cheri Beasley, 52, an associate justice on the court, to succeed Republican Mark Martin, who is leaving the chief justice’s post at the end of this month. Beasley also is the first African-American woman to be elevated to chief justice in the 200-year history of the state’s highest court. Cooper wouldn’t say whether he will name a Republican to fill Beasley’s slot to maintain the current 5-2 partisan balance. 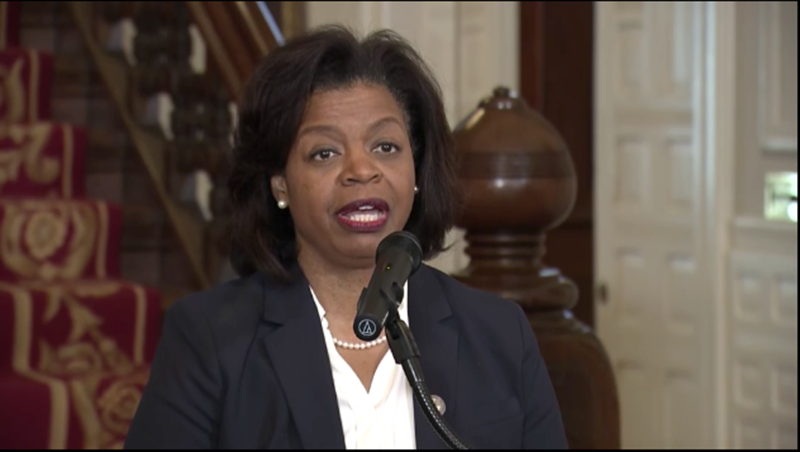 “To lead this court is to uphold the virtues of due process, equal protection, and justice for all North Carolinians,” Cooper said. Cooper said Beasley has the high legal ability, decency, integrity, and devotion to public service required for the job. He called her the right person at the right time in defending his decision to bypass longer-serving Senior Associate Justice Paul Newby, a Republican who already announced as a chief justice candidate in 2020, and Associate Justice Robin Hudson, a Democrat. Cooper said the people ultimately will decide whether Beasley and her replacement remain on the court. They would have to stand for election in 2020. Senate leader Phil Berger, R-Rockingham, issued a statement wishing Beasley well in her new role. But he said he was disappointed Cooper ignored a decades-old precedent of appointing the most senior member of the court as chief justice. “A reasonable conclusion is that he decided to pass over Justice Newby because of his party affiliation,” Berger said. N.C. Republican Party Chairman Robin Hayes was more blunt. “Cooper’s constant calls to keep our courts free from political interference rings hollow with this decision,” he said in a written statement. Martin’s last day as chief justice will be Feb. 28. He is stepping down to become dean of the law school at Regent University in Virginia Beach, Virginia. If Cooper names a Democrat to replace Beasley, the party would hold a 6-1 majority, with Newby the only remaining Republican. Asked if he would name a Republican to replace Beasley, Cooper said he was going to pick the best person for the job among many qualified candidates, some of whom previously served on the Supreme Court. He said he would decide in about a week. Beasley invoked the memory of civil rights leader Martin Luther King’s love for humanity and service. She said the symbolism of her appointment during Black History Month, and the sense of historic change, weren’t lost on her. “This is certainly not the North Carolina of 200 years ago,” she said. “The other thing I think about is the little girls along the way who ought to have a sense of promise, and hope for their futures,” Beasley said. She hopes to be an inspiration for them. In another matter, Cooper said he soon will announce when a special election would be set to fill the seat of U.S. Rep. Walter Jones, R-3rd District, who died Sunday. Interest is high among potential contenders for that seat. He said discussions continue with the State Board of Elections and lawyers to ensure all state and federal laws controlling special elections for Congress are met.